Following on strongly from our hugely successful 2003 premier release, the 2004 RRV Syrah blend highlights the growth in our understanding of this variety within the greater RRV appellation. Whereas 2003 featured an extended, cool harvest ripening period, in 2004 the heat pushed maturity at a significantly faster pace producing highly concentrated wines, yet without any sense of heaviness. The dry spring and even, consistently paced growing season, ensured berry size remained moderate and maximized the beautifully intense cool climate aromatics in the fruit. Heat prior to harvest placed considerable stress on the vines, reducing berry size and concentrating tannins, acidity and grape sugars. Once cooler coastal breezes returned we saw a realignment of sugars, yet no loss of richness and harvest began shortly thereafter. This year's blend features prominently Saralee's Trenton Station, a series of steep, low vigor, hillside blocks with incredibly shallow soils and cool east-facing exposures. These wines were dynamic in their intensity, showing great natural extract, yet also finesse and maturing their skin tannins at relatively modest sugar levels. Two additional new sources were Dutton Ranch's Green Valley site – Syrah grown in Pinot country, adjacent to our Sundawg Ridge Pinot vineyard. This juvenile crop displayed pure, cool blue aromatics and strong tannic backbone. 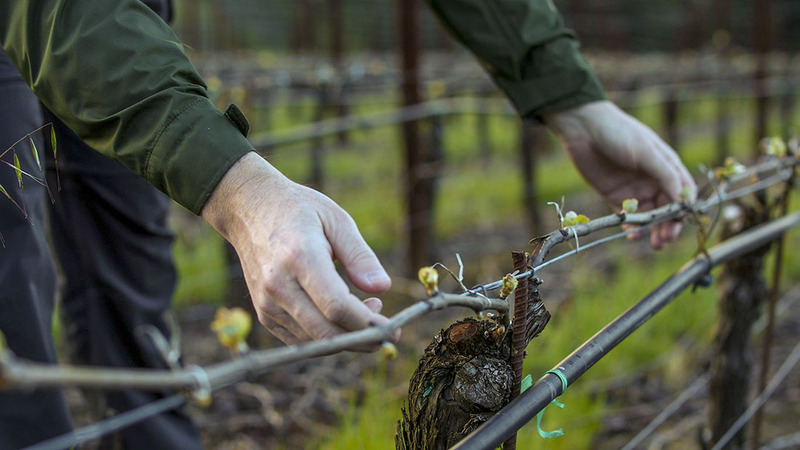 Dry Stack Vineyard, planted to our favorite Northern Rhone clone, was our last harvesting call of the year – the first fall rains came two hours after picking finished. The hallmarks of this young site were its remarkable European flavors of smoked meat, earth and violet, an intriguing prospect to follow in future harvests. Our growing confidence with Syrah enabled us to ferment this five vineyard, ten individual fermentation blend with exclusively native yeasts for the first time, a positive move that we feel maximizes aromatic complexity and favors site expression over simple fruitiness. Dark purple/black color. Soaring aromatics of blueberry, cassis and graphite with wild thyme, flowers and charcoal. The palate is immediately rich and powerful with great purity of black fruits, lighter minerals and darker smoked meat. A silky textured mid-palate maintains the sense of power allied to elegance and chewy tannins provide grip and dimension to the finish. The wine's dense fruit profile ensures it will drink well in the year after release, but patience will be rewarded with four to six years cellaring, as the inherent soil character lurking beneath the surface begins to assert itself. Serve between 60 and 62 degrees to ensure full flavor development.